Gichin Funakoshi (Funakoshi Gichin, November 10, 1868 - April 26, 1957) was one of the Okinawan karate masters who introduced karate to the Japanese mainland in 1921. He founded the Shotokan-ryu style of karate. He was born in Shuri, Okinawa and original had the family name Tominakoshi. Funakoshi had trained in both of the popular styles of Okinawan karate of the time: Shorei-ryu and Shorin-ryu. His own style was influenced by kendo distancing and timing. Shotokan is named after Funakoshi's pen name, Shoto, which means "pine waves" or "wind in the pines". Shotokan means "Shoto's house" or "Shoto's school". In 1936, Funakoshi built the first Shotokan dojo in Tokyo. He changed the name of karate to mean "empty hand" instead of "China hand" (as referred to in Okinawa); the two names sound the same in Japanese, but are written differently. Doing this upset some of his countrymen, and afterwards, Funakoshi never returned to Okinawa. This eventually led to the creation of the Japan Karate Association (JKA) in 1955 with Funakoshi as the chief instructor. Funakoshi was not supportive of all of the changes that the organization eventually made to his karate style. He remained in Tokyo until his death in 1957. After World War II, Funakoshi's surviving students formalized his teachings. 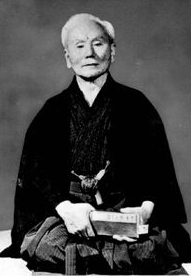 Funakoshi published several books on karate, including his autobiography, Karate-Do: My Way of Life. Quick Navigation: Back to top | Errors?